You'll be £25.00 closer to your next £10.00 credit when you purchase Fighting the Kaiser's War. What's this? Personal accounts of the Great War experiences of British soldiers are well known and plentiful, but similar accounts from the German side of no man's land are rare. This highly original book vividly describes the wartime lives and ultimate fates of ten Saxon soldiers facing the British in Flanders, revealed through their intimate diaries and correspondence. The stories of these men, from front-line trench fighters to a brigade commander, are in turn used to illustrate the wider story of thousands more who fought and died in Flanders 'for King and Country, Kaiser and Reich' with the Royal Saxon Army. 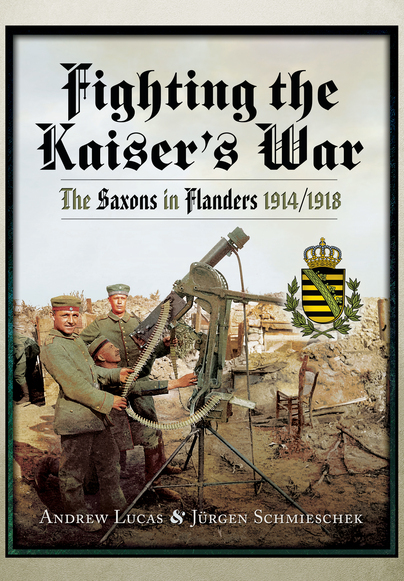 This ground-breaking work is illustrated with over 300 mostly unseen wartime photographs and other images, recording the German experience of the war in human detail and giving a rounded picture of how the Saxons lived and died in Flanders. Whilst there are numbers of personal accounts of experiences in the Great War 1914-1918, those from the German side are relatively scarce. This book describes the wartime lives and ultimate fates of 10 Saxon soldiers through their diaries and letters, providing direct insight into the thoughts and feelings of these men through four years of fighting. The individual stories of these soldiers, from front line trench fighters to a brigade commander, are in turn used to illustrate the wider story of the thousands more who fought and died in Flanders ‘for Kaiser and Reich’ and‘ for King and Country’, with the Royal Saxon Army. The Saxon troops played a major part in every campaign on the Western Front, earning the respect of the British army as brave and tenacious fighters – indeed, they were generally thought of as ‘a decent bunch’, an opinion confirmed by the 1914 Christmas truce. Using archival documents, regimental histories and unpublished personal material, this well presented Saxon experience of the conflict is the first work in English on the Royal Saxon Army during WW1. The book features an excellent collection of over 300 hundred previously unpublished wartime photographs, newspaper sketches, wartime artwork and maps. This really is an excellent and important work, and one which is highly recommended by this reviewer. Expecting a rather focused look at mid war Saxony in Flanders, I was seriously impressed by the robustness of the study. This is a book that any fan of world war one should possess. I really felt there were three books and at the end I wanted another in the series… there really should be a series if indeed the authors can resource it. Initially there is a mindnumbing set of details about Saxon actions broken down by unit and year. While this might seem like mundane research, suddenly the style of the authors and publisher comes to the front. This is the best picture collection I have seen in a book. The publisher and authors interspersed the pictures and maps throughout the text along with insets telling side stories. The affect was incredibly good. The pictures are clear, well annotated and not the normal "repeated pictures". While the story is book 1, it is the collection of pictures that put you on your feet. Rare, well explained, and integrated into the text. This is not the standard picture section that my books have been relegated to. This is real time expansion of your understanding. These pictures no doubt took a lifetime to collect and I am very pleased to have read it. Just when you thought this was well worth the money you come along to chapter 9. OMG The series of individual histories of soldiers and officers during the war. This is complete with pictures and letters from the soldier. This long chapter could not have been assembled without a serious collection of diaries and papers. All translated nicely into English and a real treasure trove that makes his third book worth the price of admission alone. You will not regret this one at all.